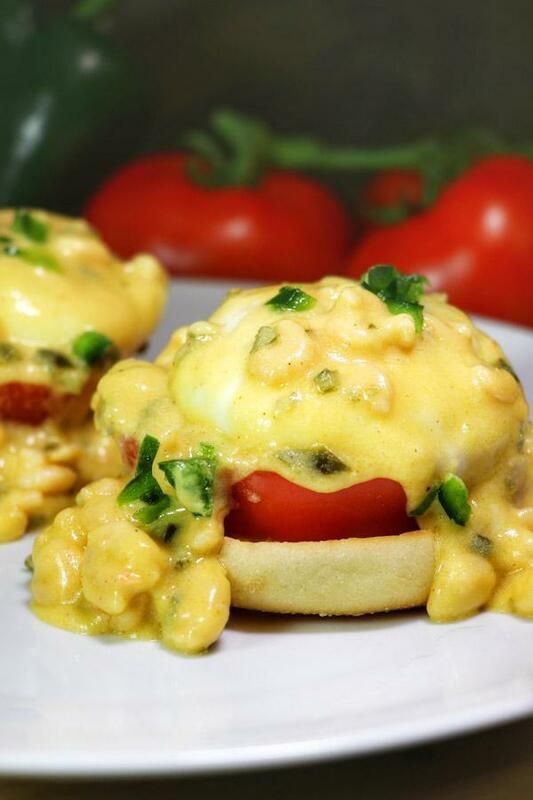 Eggs Benedict is one of my all time favorite things to eat and I know that's true among many of my friends as well. It's a special dish that is generally reserved for special occasions and restaurants. However, it's easier to make at home than you might imagine. However, I gotta say - these are absolutely delicious. While I work with a lot of brands, you know I try not to make any claims unless I'm personally a fan, this is one of those products. For instance, how frustrating is it to get English muffins that don't split properly? Even worse is when they come nicely pre-sliced but just don't have the right texture that it both firm enough to support jam as well as textured enough to have plenty of spots for butter to melt into. Initially, I wasn't sure what recipe to make - Bays English Muffins sent me a bunch of thought starters ranging from a Chocolate Chunk Cheesecake Spread to the English Muffins French Toast featured in the video above. However, I wanted to try something even more special. Something that I love to eat at restaurants but never really thought I could make at home. For me, than meant trying to make a version of Eggs Benedict from scratch ... including poaching an egg properly! There are many articles out there about how to poach eggs and everyone has their own variation on the core concept. It's all about balance though. You gotta be gentle and deliberate but once you understand the technique it's even easier than frying an egg. Poaching Your Eggs is as Easy as 1, 2, 3! Step One - take a large skillet and add 2" of water (do NOT add salt) and bring it to nearly a boil. Some people say that by adding a little white vinegar that it will help the whites coagulate better. They are correct, but I find it generally unnecessary. You'll know it's ready when the bottom of the water is covered in bubbles and there's beginning to be movement but it's not quite boiling yet. 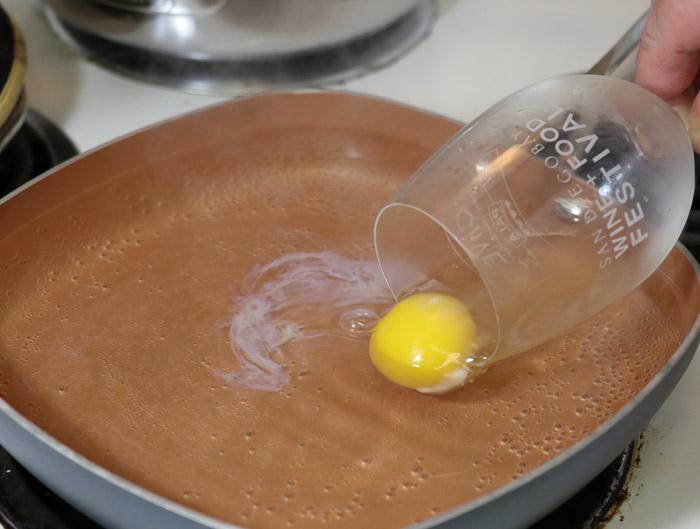 Spte Two - crack the eggs individually into a wine glass and stir the water so that it is rotating around the pan and then gently dip the wine glass into the water and let the egg slide out into the water. If might take a little bit of practice, but if you do this properly the result should be that you have an intact yolk with the whites wrapped around the yolk. Repeat this process as needed and do so into a clockwise rotation so you know when the eggs need to be removed. Step Three - after about 2-3 minutes (depending on altitude, size of egg, and prefered "doneness"), retrieve the egg using a slotted spoon or slotted spatula so that it can drain slightly before serving it. At this point, you might want to place it on a towel to absorb extra moisture before serving. Similarly, you might want to trim the wispy edges off of the egg with a knife or kitchen shears. Now you've got a perfect poached egg and it's really not that complicated. Plus, when cooking it this way you'll actually be eating more healthy since there's no butter or oil needed like when you fry it in the pan. That's for another story though ... this eggs benedict recipe is delicious, but it's anything but healthy for you! I'm never satisfied with traditional. I was inspired by a visit to Court of Two Sisters in New Orleans when I created this recipe. They had a seafood sauce on their Jazz Brunch and so I asked the chef if he could put that on my eggs benedict, instead of on the side. While that sauce was delicious, ultimately it was too heavy and overpowered the eggs. With this one though, it is sinfully rich but has a gentle spicy flavor that compliments the eggs, tomato, and shrimp. While this recipe for Creamy Poblano Shrimp Eggs Benedict seems fairly complicated, it's really easy to make. However, it does require some pre-planning to get everything timed correctly. 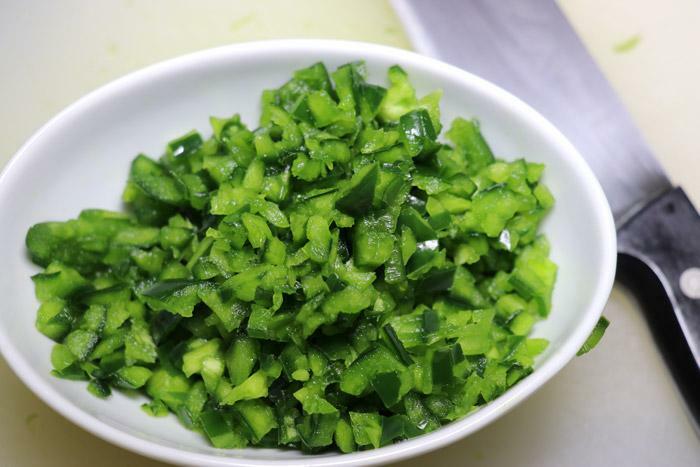 1 poblano pepper - in some areas, this will be referred to as a pasilla pepper. They are actually different peppers but you can use pasilla if there's no poblanos available at your grocery store. 12-16oz bag of "salad shrimp"
Place the butter in a skillet and melt slowly. While the butter is melting, dice the poblano pepper and then place it and the garlic in the pan with the melted butter and saute. Turn the burner up to a medium heat. When butter is fully melted and the peppers have been cooked slightly till they have softened, gently whisk in the flower and continue to stir until the flour begins to brown slightly. Add sour cream, cheese, and chicken stock and continue to stir till everything is well blended. Reduce the heat and thaw the shrimp. 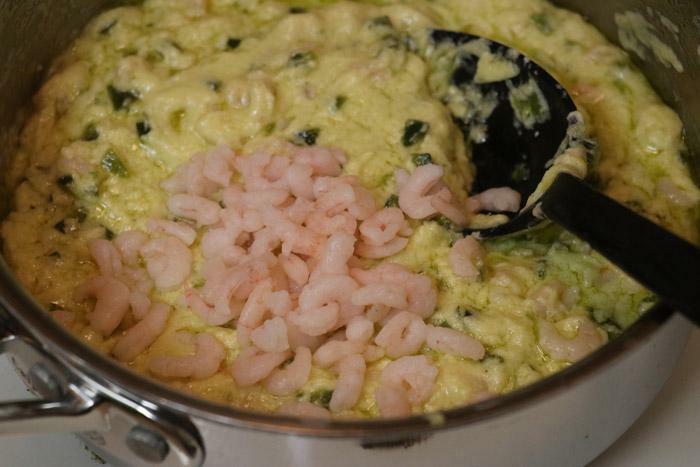 Once the shrimp are thawed (place in a bowl for 5-10 min and then rinse in a colander), add them to the sauce and continue to cook till the mixture has a smooth sauce-like consistency. Cut the tomato into thick slices and toast the Bays English Muffins. We're only moments away from being done, so you should take this opportunity to make sure everyone is ready to be served. Or, if you are planning a breakfast in bed Mothers Day Surprise, make sure she's up and ready for breakfast! Now, it's time to poach the eggs using the technique I described above. The good news is that with this recipe, any imperfections will be hidden by the sauce so don't worry too much. 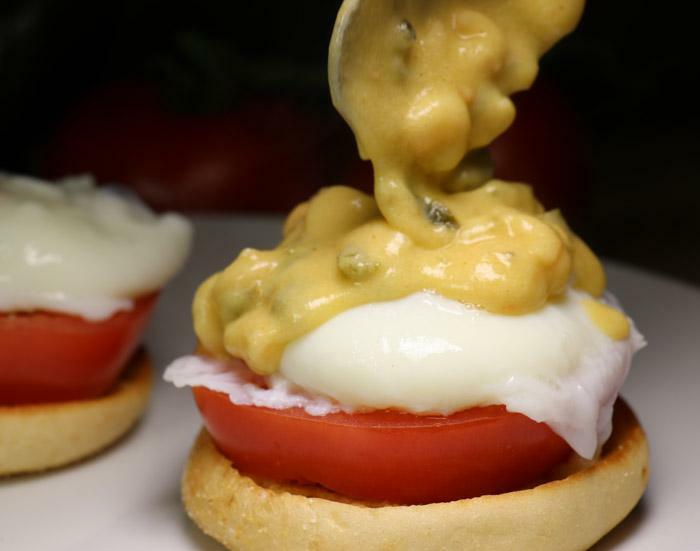 Place the tomato slices on the Bays English Muffins and top with the poached egg and cover in the Creamy Poblano Shrimp sauce you just made. I loved using Bays English Muffins in this recipe because despite the liquid from the tomatoes and of course, the sauce - they held up perfectly. 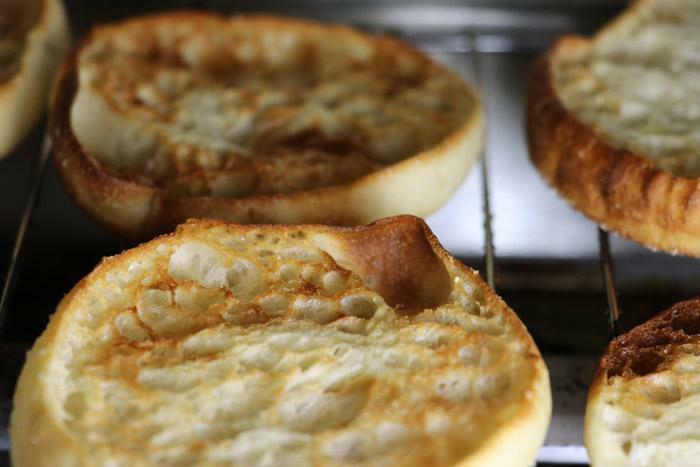 You can buy Bays English Muffins in most supermarkets, but make sure to check their store locator for specifics.